So what are your plans for New Year’s Eve? Do you have the champagne iced down? 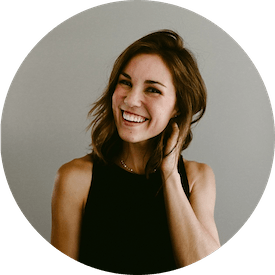 Is your sequined dress polished and ready for dancing? Did you buy a new lipstick to ready your pucker for a midnight kiss? Something about New Year’s Eve makes me jittery with excitement. The parties and bubbles and noisemakers and confetti make the world so shiny and glamorous for a brief moment. For a few hours, regardless of the year you’ve had, there’s laughter and excitement and so much hope for the coming year. I love an excuse for a party, but one that gives you the opportunity to celebrate time and the promises of tomorrow is beautiful, if you ask me. This year, Brett and I celebrating with some friends in a more relaxed fashion, and I can’t wait to tell you all about it soon. 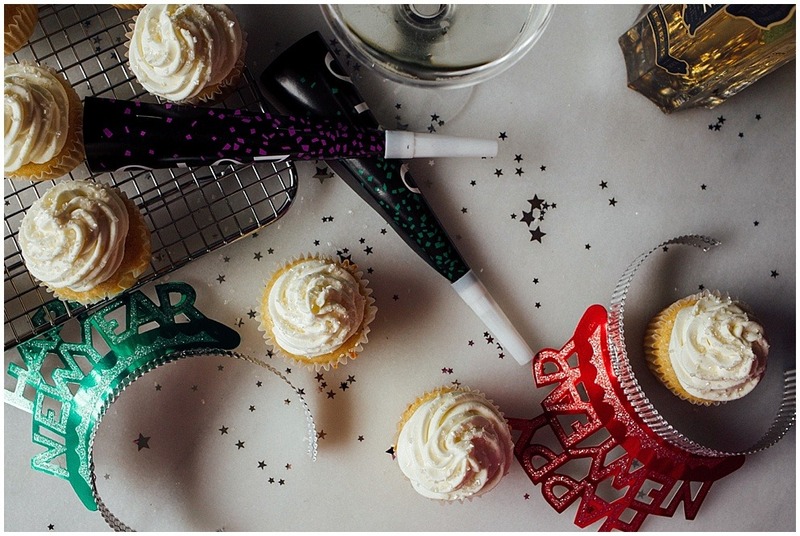 In the meantime, I’m excited to share these champagne elderflower cupcakes with you, as I’m sure your NYE party is looking for a little extra sugar, booze, and sparkle. 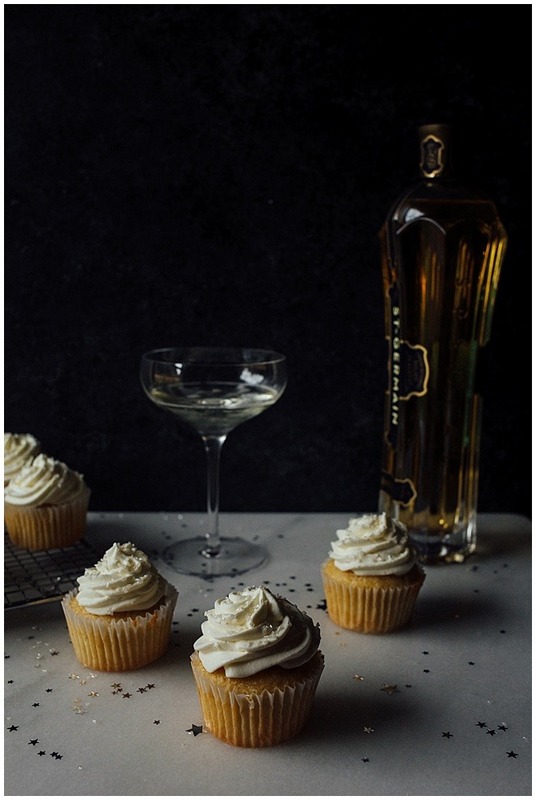 These champagne elderflower cupcakes are lightly flavored with champagne and elderflower liqueur. 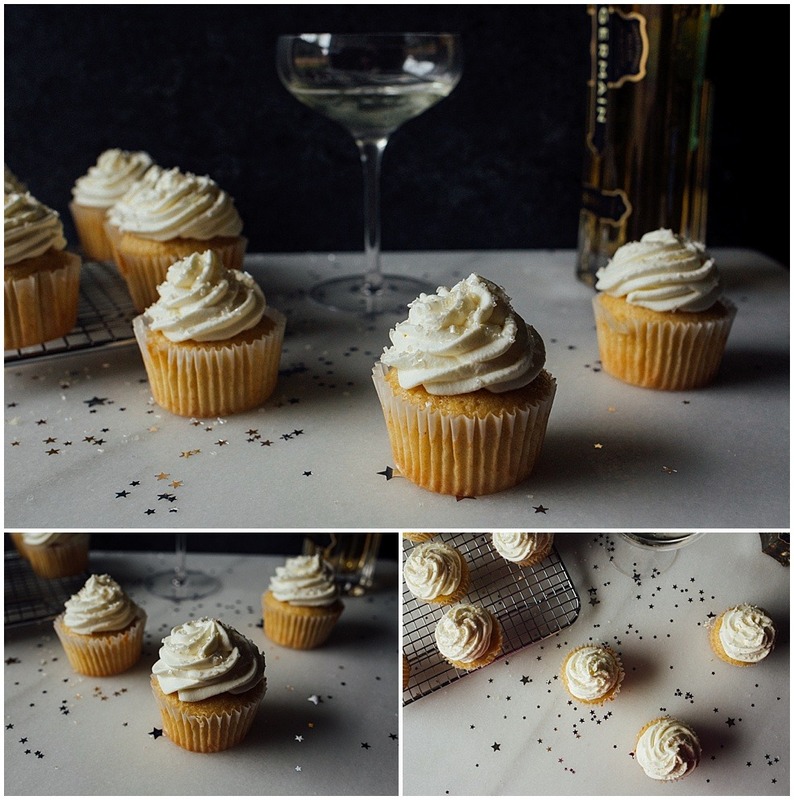 Filled with a champagne custard and topped with a zesty lemon elderflower whipped cream frosting, the cupcakes taste like a cocktail in cake form. What better time to try them out than New Year’s Eve?! 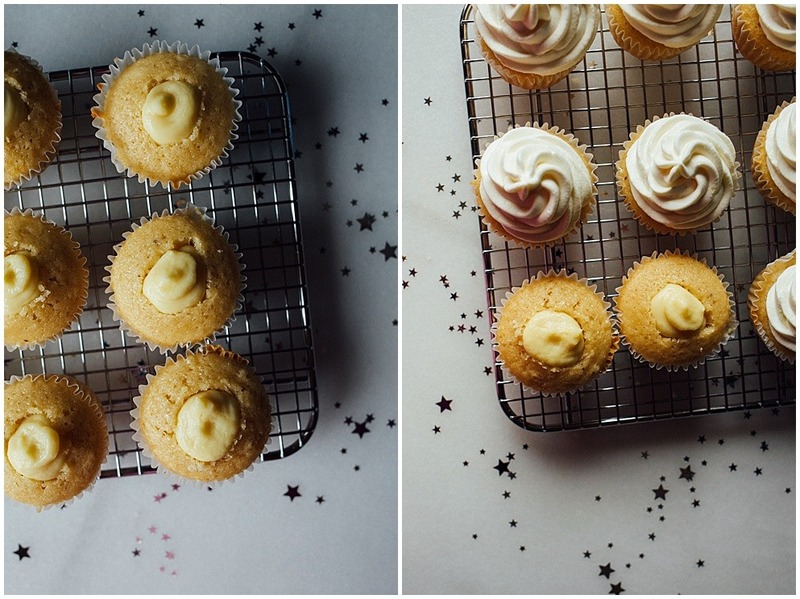 While the champagne elderflower cupcakes are best eaten the day they’re prepared, they keep well in the fridge, so you can make them the morning of your party and still count on them being delicious once midnight rolls around. If you’re feeling extra festive, serve them alongside an elderflower and champagne cocktail- with only 2 ingredients and zero prep time, this cocktail is a cinch to throw together and will make your cupcakes shine. All of my hopes, blessings, and love to you and yours this coming year. I wish you all of the best that life has to offer and pray that 2017 is your most delicious year yet. I can’t wait to share more with you in the coming year. Happy New Year and cheers to you! 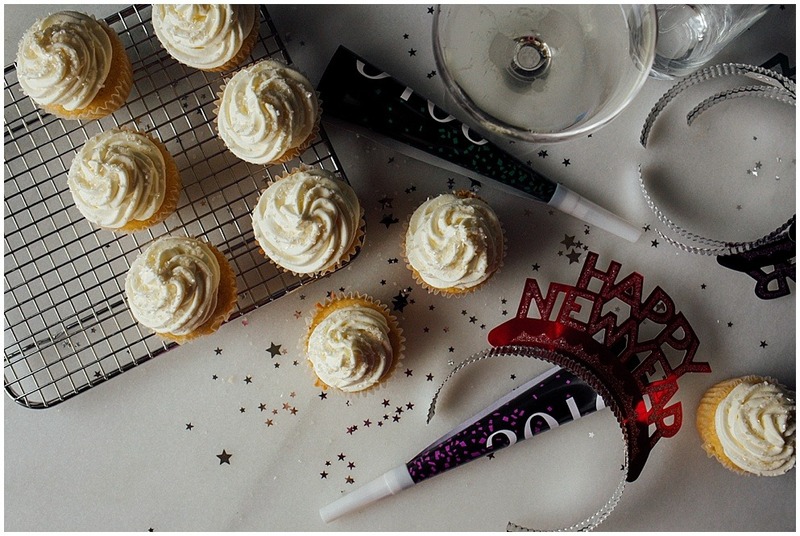 Scented with elderflower liqueur, lemon zest, and bubbly champagne, these champagne elderflower cupcakes are a festive dessert to include in your holiday and New Year’s Eve celebrations! Preheat the oven to 350 degrees and line 24 cupcake tins with papers. In a medium sized bowl, stir together the flour, baking powder, and salt and set aside. In the bowl of a stand mixer, combine the eggs, sugar, and vanilla and beat on medium speed for 1 minute. Turn the speed down to low and slowly add in the oil. Add half of the dry ingredients and stir on low speed to combine. Add the wine and liquor, stirring briefly to combine, and then add the remaining dry ingredients. Mix just until combined- do not overmix. Scrape the sides of the bowl and fold the batter to ensure it is thoroughly mixed. Put approximately 1/4 cup of batter in each cupcake liner (I use a large cookie scoop to fill mine), and then place the prepared pans in the oven. I typically bake one pan at a time to ensure even baking, but you can prepare them how you prefer. Rotate in the oven if you notice on side of the pan getting darker than the other. Bake in the oven for 22-25 minutes, or until an inserted toothpick comes out clean. Allow to cool completely on a cooling rack while you prepare the remaining elements. Heat the half and half in a medium sized saucepan on the stove over medium-low heat until it is hot (but not boiling). In a separate medium sized bowl, whisk together the egg yolks, sugar, and salt. Add the wine and cornstarch, whisking until combined. Slowly add 1/3 of the hot half and half, whisking the whole time to ensure the eggs don’t get cooked. Pour the entirety of the mixture back in the saucepan and continue to cook it all on the stove over medium-low heat. You’ll notice that the mixture will begin to thicken and perhaps even bubble slightly. Remove from the heat when the custard is a thick pudding consistency. Whisk in the butter and vanilla and place the custard into a small bowl. Place a sheet of plastic directly on top of the custard, to prevent a skin from forming on the top, and place the bowl in the fridge to cool. Beat the cream until soft peaks form. Add the sugar, elderflower liquor, and zest and continue beating just until stiff peaks form. Fold in 1/2 cup of the chilled custard into the whipped cream. 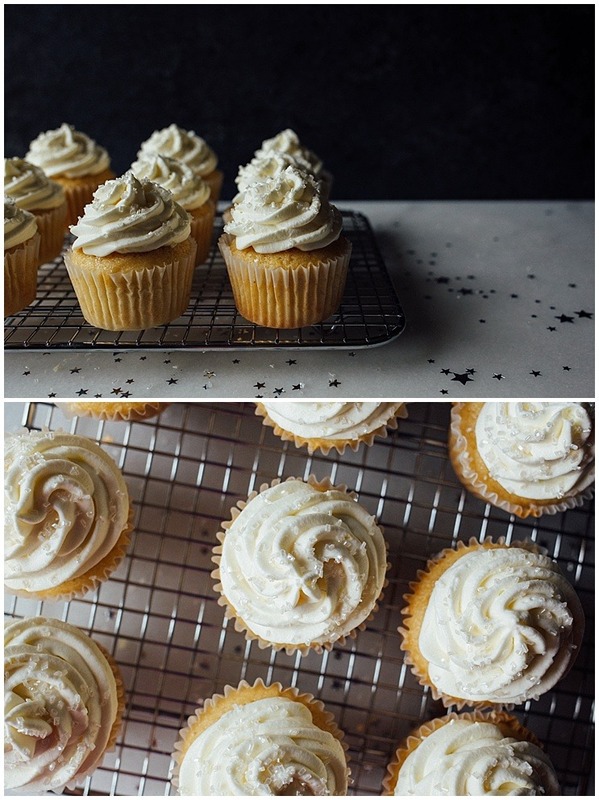 Using a paring knife, cut a small, tablespoon sized whole in the top of each cupcake. This is where the custard filling will go, so feel free to make the hole somewhat deep but not wider than half the width of the cupcake. Spoon or pipe the custard into the holes in the cupcakes. About 1 tablespoon of custard should go in each cupcake. Pipe or dollop the whipping cream frosting on each cupcake. I used a piping bag fitted with a Wilton 1M tip to pipe my frosting. Store the cupcakes in the fridge. They are best eaten on the day they are assembled. A sparkling cocktail to pair with your cupcakes! Pour the elderflower liqueur in the bottom of a champagne flute. Top with the champagne. Serve immediately. Can I make a cake instead? Custard in between the layers and frosting on top? Would the measurement for 24 cupcakes be enough for a 2 layer cake? Love your blog, BTW. Hi there! I haven’t tried as a cake, but I would think it could make two very thin 8″ layers! The filling would be enough as well. The Elderflower cupcakes were a hit at my Royal Wedding Watch party! We enjoyed the few that were left later in week as they stayed fresh in the fridge. Thanks for this recipe. Could you please send these recipes to my email. I would be so grateful as I am in a remote location and can’t print! These cupcakes sound so awesome and lite, I can’t wait. Could you please send these recipes to my email as I am in a very inconvenient location and cannot point. Thanking you in advance, Kate! Would love to make these for a bonco party after work. Can I bake and freeze, make icing and custard night before and assemble Day of? I’m intrigued. 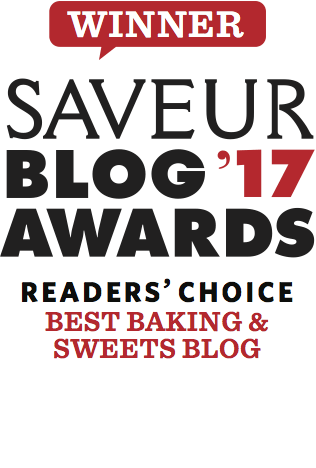 What does elderflower syrup taste like? Oh dear ! I have made The Elderflower Syrup last spring and shall use it for these Cupcakes. Thank you so much ! Have a fruitful and happy 2017 ! Elderflower syrup sounds fantastic! I used elderflower liquor in this recipe, but I’m sure the syrup has the same effect. Happy New Year to you!